Aeromobile Flensted Mobile (FM30102) at Pure Design Kids / Toys / Flensted Mobiles ::: Kids' Toys, Furniture and More at Pure Design Kids! Wow, I'd love to be a pilot!... Small aeroplanes flying in formation or chasing each other around the little cloud. Like a flying merry-go-round. 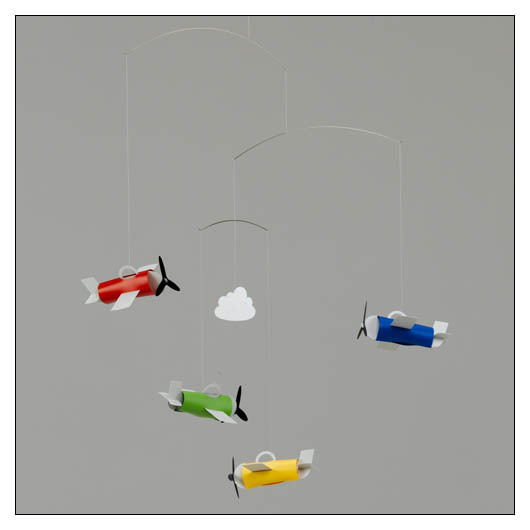 With these mobiles hanging above their beds, children will dream of flying. The mobile is very suitable to be seen from below.